Our country has seen major highs and lows this year. Wasn’t it only earlier this 2013 that we saw the stock market break record-highs at 7,000-level? We also saw how it went back to 5,900-level this December wiping out earlier gains. It seems like a trying time, but if you really are a long term investor, I continue to encourage you to Keep Calm and Invest on. We also witnessed the calamities that struck our nation but our Filipino spirit continues to rise even higher in every adversity. Through highs and lows, I wish to thank the smart investors who were with us this year. During the same time last year, I was thanking our 17,000 followers on Facebook. Today, I can’t believe that we’ve grown to 40,000 in a span of one year. I am also thankful to all our viewers on YouTube as we reached the 1 MILLION total views milestone this year. I hope that every episode has helped you be well informed in every investing decision you make. To the attendees of our very first international seminar in Dubai and to the hundreds of attendees of our seminars this year, thank you. I may not able to meet each of one of you, but your presence in our events continues to inspire me to keep on sharing the knowledge of smart investing. I hope in my own way, I was able to help you take the first few steps toward financial freedom. And to Filipinos all over the world, thank you for viewing our online seminar. Together we have seen the highs and lows of 2013. Here’s to wishing that we all rise higher this coming 2014. From my family to yours, I wish you all a very merry Christmas and a prosperous new year & the years to come! Thank you Aya and the Pesos and Sense team for sharing your knowledge! HAPPY NEW YEAR 2014 idol Aya and PnS team! Big Thanks to all your free financial lessons you’ve shared to us! 2014 will be a super great year for us investors! Yes! Lets claim it! More power to you and more financial investments learnings to come in 2014! GODBLESS you and your family! Happy New Year Sir Aya to the Pesos and Sense team and your family. Pesos and Sense deserved this growth since you’ve been very generous in imparting your knowledge to us. 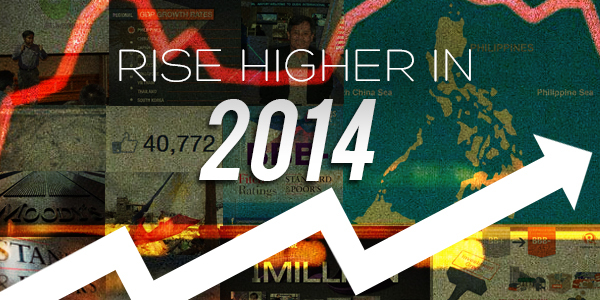 I hope the market will reach new record highs this 2014 that would encourage Pinoys to invest. Again, thank you Sir Aya! More power in 2014.